The Customs Service of Moscow’s Domodedovo airport has confiscated a smuggled store of skins and horns of rare animals, included in the list by CITES. A citizen of Tajikistan intended to sell them in Russia. “At the customs checkpoint of passengers and luggage of the flight from Dushanbe to Moscow in the international arrival hall customs workers have detained a Tajik citizen. At the inspection of the carton boxes belonging to him skins, horns and skulls of rare animals were found”, said the spokesman of the Customs Service. 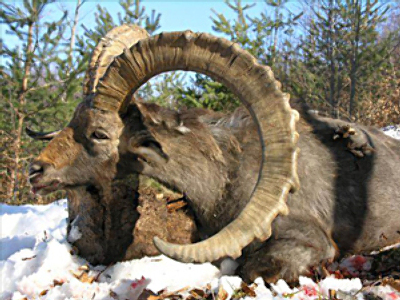 The customs employees have confiscated skins, skulls and horns of Siberian ibex, argali and markhor – all of which are considered to be on the brink of extinction. Experts have concluded that animals, parts of which were found at the customs checkpoint, are on the list of The Convention on International Trade in Endangered Species of Wild Fauna and Flora (CITES). Export, re-export and import of such animals, their parts and production from these parts for commercial purposes is forbidden and can be made only in exclusive circumstances, under the special permissions given by the administrative bodies of CITES. The total weight of the contraband comes to 110 kilos. The total worth of the confiscated cargo is estimated to be 3.3 million roubles ($US 102,000), the press-service of the Federal Customs Service reported on Thursday. An investigation is underway, the results of which will show whether the Tajik citizen will be tried according to Russian law.